Moisturizing, anti-aging and brightening mask. Apply the mask in a thick layer over the whole face to rebalance skin’s moisture levels while relaxing the features and brightening the complexion. A soothing mask suitable for combination and normal to dry skin that respects the most sensitive skin without causing irritation. Apply the mask once or twice a week according to your skin’s needs. Very white, thick cream rich in tried and tested active ingredients, with an ultra-fresh, mouthwatering fragrance reminiscent of orange and basil that vanishes after rinsing. The mask dries after 8 to 10 minutes and produces a deeply refreshing sensation. Apply the mask in a generous layer to the face on clean, dry skin. Leave 5 to 10 minutes for the active ingredients to penetrate deep down and for the mask to become dry. Then moisten slightly, lather with circular movements and finish with a damp sponge. 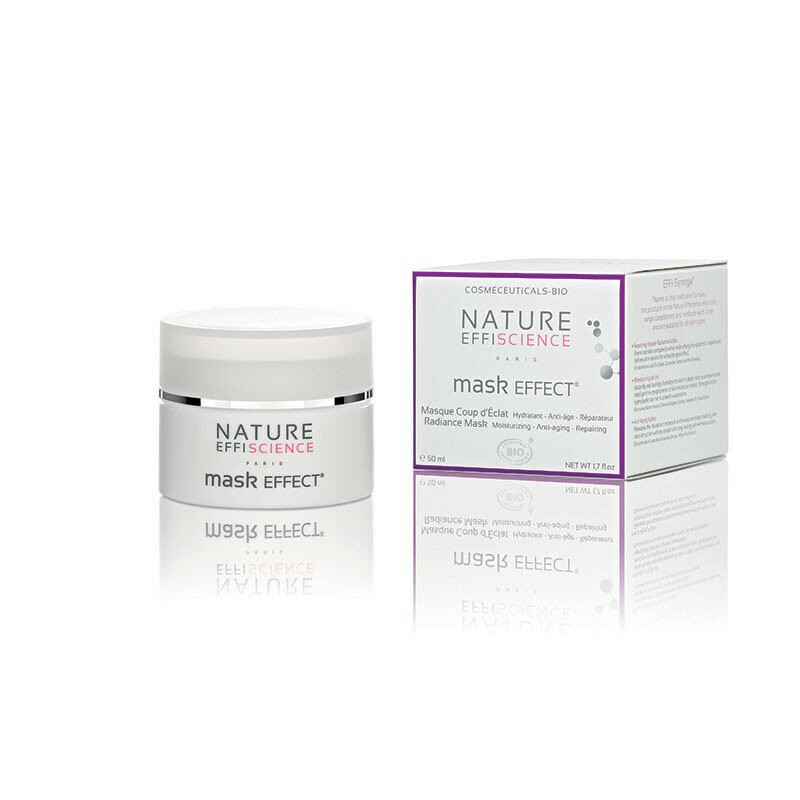 mask EFFECT® can be used as a course of intensive treatment over a 3-week period once or twice a year. It will soothe the epidermis, even out the complexion and smooth the features with a lasting effect. In intensive treatment, apply a small amount once a day all over the face on clean, dry skin like a cream until completely absorbed, preferably in the evening. Remove any surplus around the eyebrows. There is no need to rinse. Detoxifying action: Using mask EFFECT® with the peeling EFFECT® scrub increases in-depth impurity and sebum detoxification thanks to the combination of ingredients derived from Zinc and Basil. It is effective on blackheads. Healing action: You can also use mask EFFECT® with the booster EFFECT® serum for an anti-aging healing action, thanks to the combination of Hyaluronic Acid and Zinc Oxide. Apply the mask in a generous layer to the face, neck and décolleté on clean, dry skin once or twice a week, preferably after the peeling EFFECT® scrub. Leave on the skin (5 minutes for combination and normal skin, 6–10 minutes for dry skin) to allow the active ingredients to penetrate more deeply, then moisten slightly, lather with circular movements and finish with a damp sponge. It can also be used as an intensive moisturizing treatment for hypersensitive skin. In this case, apply a small amount of the mask like a day cream for 3 weeks, working into the skin with circular movements until absorbed. Remove any surplus around the eyebrows. Skin is enhanced, plumped up, de-stressed and soft. The synergistic action of mask EFFECT® instantly hydrates the epidermis deep down thanks to the oily Avocado, Apricot and Shea complex combined with the Aloe Vera extract. Facial contractions are relaxed, and in just one hour the skin’s surface is smoother. After 24 hours, wrinkles fade. Immobilizing the wrinkles enables epidermal reconstruction. Skin is bright, even and denser and wrinkles fade. The synergistic action of mask EFFECT® promotes collagen fiber renewal and urea production for an immediate made-to-measure firming and moisturizing action that lasts. 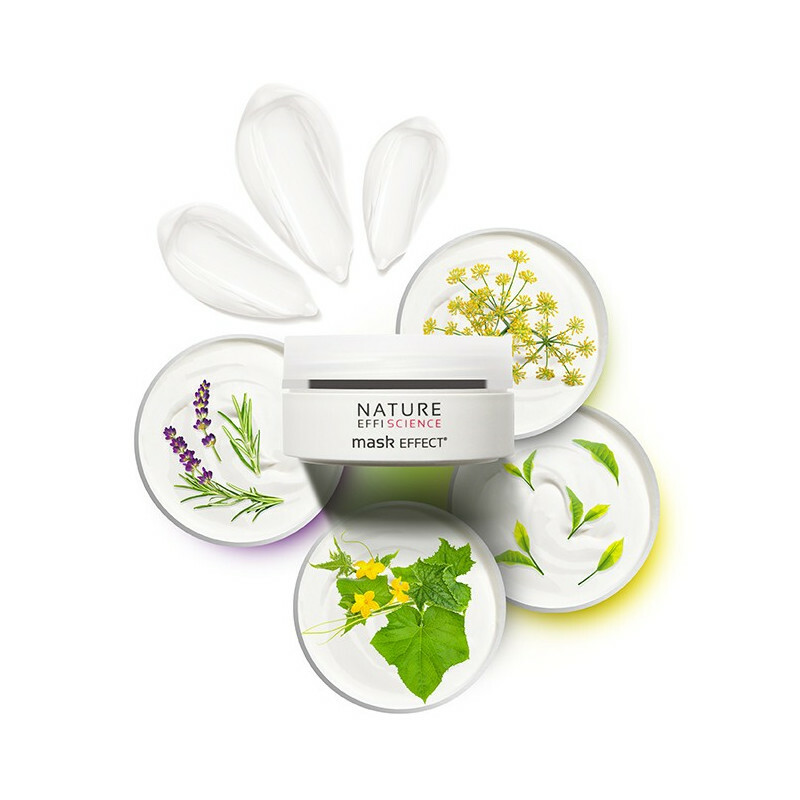 Skin is denser and the facial contour becomes more well-defined thanks to the high concentration of Stoechas Lavender, Silica and Samphire active ingredients. The immobilization of wrinkles coupled with a redensifying and smoothing effect help rapidly and lastingly reduce the depth of expression lines. This mask has a very comprehensive action: it moisturizes, soothes, tones, purifies and heals. It can be applied either in a thick layer and left to dry, or like a cream until completely absorbed. The mask EFFECT® formula contains no Parabens or Phthalates, no Mineral Oils, no Monoethanolamine, no Diethanolamine, no Triethanolamine, no silicone and no any ingredients of animal origin. 66% of the entire formula is organically grown, which is 7 times more than the percentage demanded by the ECOCERT standard required for organic certification.